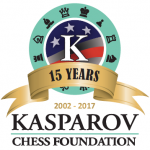 The Kasparov Chess Foundation Asia-Pacific (KCFAP), in conjunction with the Kasparov Chess Foundation’s 15th Anniversary Celebrations, has decided on a year-round program for the introduction of Chess in Education in the region. Our Chess in Education initiative in partnership with National Chess Federations and their respective Education Ministries is kicking off with a four-country tour – Guam, Philippines, Myanmar, and Malaysia – from 22 March to 6 April 2017. Michael Khodarkovsky, FIDE Senior Trainer and the captain of numerous USA National Teams, and who is also President of the Kasparov Chess Foundation, will be the principal speaker at the Chess in Education Seminars and Workshops.